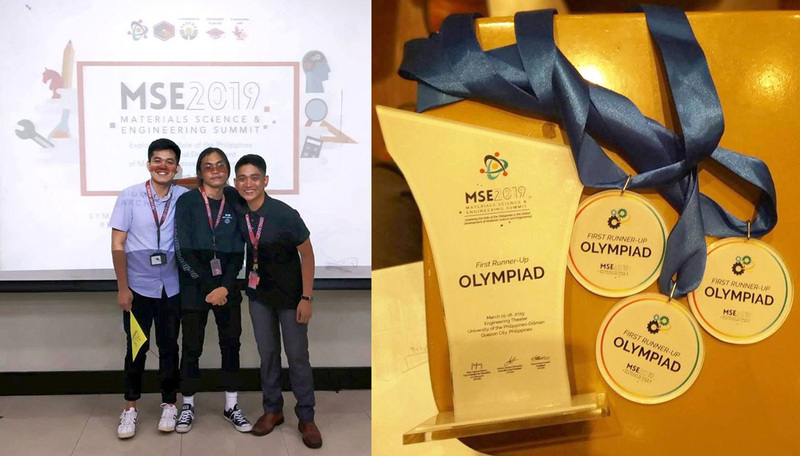 Representing Materials Science and Engineering (MSE) of Mapúa University, the team composed of Austine F. Fernando, Rhaye Stephen B. Sosa, and Veejay T. Valdez won first runner-up in the MSE Summit Olympiad 2019. The Olympiad was an inter-university quiz contest covering fundamentals of Materials Science and Engineering and allied disciplines. The Olympiad, held last March 16 in Melchor Hall, University of the Philippines Diliman, was part of the two-day MSE Summit, the country's leading avenue for students, professionals, and enthusiasts to take part in celebration of Materials Science and Engineering. This year, the Summit's theme was "Exploring the Role of the Philippines in the Global Development of Materials Science and Engineering."